The line up of the EP Already Late includes the members Eliud Varela, Diego Mejia, and Ramon Castillo. Eliud is in charge of the vocals, guitars, keys, bass and other virtual instruments. Diego Mejia is on drums, while Ramon Castillo on protools. 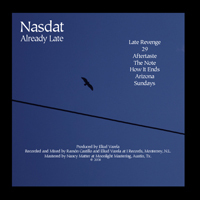 Nasdat’s EP Line up comprises different members from its Live line up. In the Live Line up, Eliud is on vocals and guitars, together with Rodrigo Lopez Neri (Bass), Gilberto Lozano (Keyboard) and Adrian Hinojosa (Drums). The vocalist Eliud Varela is the only one present in both. Nasdat was produced by the vocalist himself, and was recorded by Ramon Castillo. Nancy Matter mastered the album in Moonlight Mastering in Austin, Texas. This collboration led to an album that Nasdat decided to release for free. As a whole, Already Late is not hard to like at all. It does not go to the far end of rock music, so it can appeal to anyone who likes alternative music. Eliud’s vocals, mesmerizing and strangely touching, is also striking to listen to. Perhaps the best thing about Already Late is the uniqueness it brings to the Indie music scene. Where everybody else is creating sentimental, electronic or hip music, Nasdat sticks to its signature alternative rock style. It doesn't work again. This band is stellar.